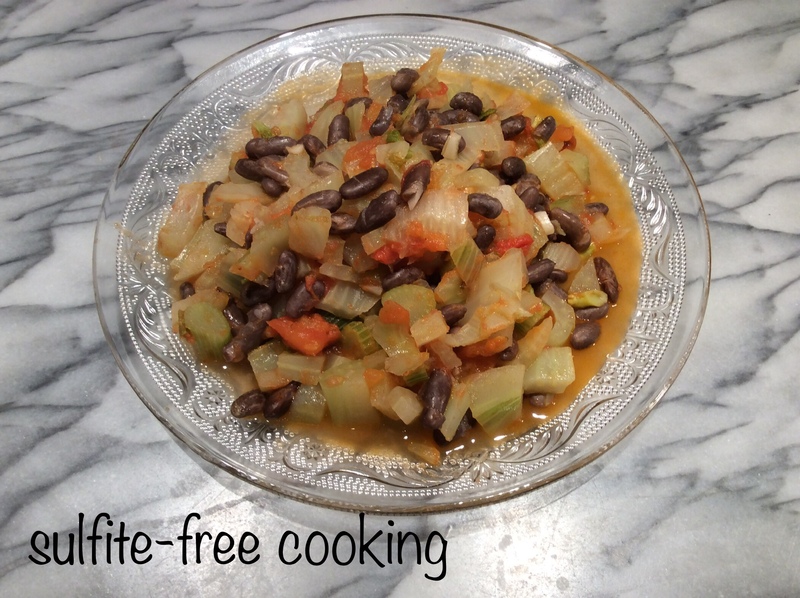 fennel and dried beans in tomato sauce, a quick meal, and let’s not be afraid of the unknown! This meal is ready in less than half an hour, dear neighbors, provided the beans have already been cooked ! Those of you in a hurry may use canned beans, of course, as long as the only other ingredients listed are water and salt. As far as I am concerned, I still have dried beans from our garden, of an undefined color, since they were originally meant to be green beans – but that we ended up leaving to dry, because of the lack of rain last summer. I have kept them in a jar in our basement fridge, and after five months of varied use (soups, chili, tacos, salads) today they are cooked along with fennel and tomatoes, the latter also taken out from my freezer! Leftover dried beans from last summer’s crop… Don’t ask what variety they are! – 300g fresh or frozen tomatoes… depending on the season ! – white pepper, freshly ground is better ! **Fennel is not a vegetable that ages well ! Do not let it sit in your fridge for too long after you have bought it. 1. Coarsely chop fennel, mince garlic clove (of which I also remove the green sprout), and set aside. Run frozen tomatoes under hot tap water so you can easily peel them, then dice into big chunks. 2. Heat oil in a large saucepan, add fennel and garlic, and cook for about 5 minutes on medium-low, stirring, until fennel starts sticking to the pan. Starting to stick: a couple of chunks turned lightly brown. Don’t let them burn! 3. Add tomato dice, salt, white pepper, hot pepper if desired, stir, and cook another ten minutes or so, stirring occasionally, until water from tomatoes has evaporated, fennel has softened and juices have slightly thickened. After ten minutes some of the liquid has evaporated and a sauce is forming. Time to add the beans! 4. Add cooked beans to pot, stir, and cover (so the sauce doesn’t completely evaporate!). All you need now is 5 more minutes to warm everything up. Time to eat ! P-S : Don’t forget that this is crêpe season – wouldn’t it be a nice way to end your meal ? Fennel has not always been present in our plates… this particular vegetable not being a classic ingredient of the different cuisines I got to taste as the years went by, be they from my native « Bourbonnais », the Azores, or even the U.S. Nowadays, I often include it raw in the salad that invariably fills up our plates before the main course, just as I add shredded carrot, beet, or sliced radish. With a little white miso dressing (made from white miso paste, rice vinegar and sesame oil – recipe here), fennel is no longer a pariah in our household ! This means we previously had biases. Who doesn’t ? But by avoiding what we don’t know, we run the risk of missing out on a wonderful new experience for our taste buds ! What about yours, dear neighbors, are they ready for new adventures ?